A resource I have found beneficial is The Cultural Atlas of the World series. There are several volumes in the series; one I’ve recently been gleaning is The Roman World, by Tim Cornell and John Matthews. The opening chapter, “A City Destined to Grow Great,” is obviously dealing with the city of Rome. But first an overview of the geography of Italy is given, including some reasons why the location was chosen for the foundation of this ancient city (ca. 753 BC). The most important feature of the historical geography of Italy is the close interaction of plain, hill and mountain. Only about 1/5 of the total land surface of Italy is officially classified as plain (that is, land below 300 meters), and of this lowland area more than 70% is accounted for by the valley of the Po [north Italy, runs east-west, LM]. Of the rest, about 2/5 is classified as mountain (land over 1000 meters) and the remaining 2/5 as hill (land between 300 and 1000 meters). The alternation of these types of relief and their distribution throughout the country create a great diversity of climatic conditions and sharp contrasts in the physical appearance of the landscape from one region to another. Italy is separated from central Europe by the great barrier of the Alps. In spite of their altitude these mountains have not kept Italy isolated from the rest of the continent. Although the winter snows make them impenetrable for more than half the year, most of the passes have been known since the earliest times; movements of people across the Alps have taken place throughout history, sometimes on a very large scale, for example during the incursions of the Celts and the Cimbri in the republican period and the barbarian invasions in the 5th and 6th centuries of our era. In general the Tyrrhenian side [western side, LM] enjoys certain natural advantages over the Adriatic side . . . These differences relate largely to climate and to the nature of the soil . . . The Tyrrhenian coast is moreover fortunate in being served by relatively large rivers, at least two of which, the Tiber and the Arno, were navigable waterways in classical antiquity. The streams which flow into the Adriatic on the other hand are mostly dried up in the summer, and in winter become raging torrents which erode the thin soil from the upland slopes. The Adriatic coast is at a further disadvantage in having no good harbors. The consequence of this natural imbalance has been that the western side of Italy has played a more prominent part in the history of civilization than the east, ever since the earliest Greek colonists rejected the desolate Adriatic coast and chose to make their homes on the Ionian and Tyrrhenian shores.
. . . Along the Tyrrhenian coast is a series of small alluvial plains, while the interior of the region is traversed by an interconnected chain of elevated basins which borders the eastern side; the most important of these alluvial valleys are the upper Arno between Florence and Arezzo, The Val di Chiana, the middle Tiber, and the Liri, Sacco and Volturno valleys which connect Latium and Campania. These river valleys are also natural corridors of communication, and together they form the main longitudinal route along the western side of Italy which is followed today by the main railroad track and the Autostrada del Sole between Florence and Naples. The chief natural lines of communication from the coast to the interior also run along the river valleys, and above all along the Tiber. The lower Tiber valley is the nodal point of the network of natural communications of central Italy, and it was inevitable that the lowest available crossing of the Tiber, which occurs at Rome, should become an important center (emp. mine, LM). A defensible position with a good supply of fresh water, it dominated the crossing point at the Tiber island, where the first bridge, the Pons Sublicius, was constructed in the reign of King Ancus Marcius. In historical times, this part of the city comprised the commercial harbor (the Portus) and the cattle marker (the Forum Boarium). It was also the site of the “Great Altar” of Hercules. . . (pgs. 11-14). 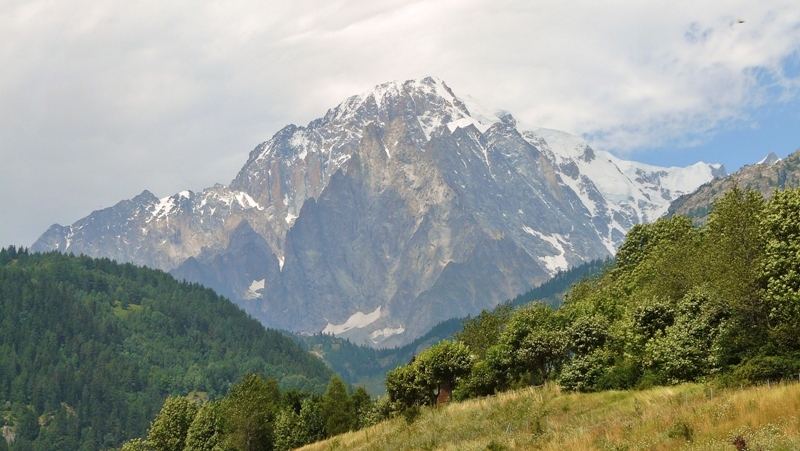 The highest point of elevation in Italy is Mont Blanc, in Aosta Valley. Mont Blanc. Photo: Wikipedia Commons. There are several scriptural references to Rome, which we plan to consider at a later time. This entry was posted on Saturday, February 25th, 2012 at 9:26 PM and is filed under Bible History and Geography, Bible Study, Italy, New Testament, Resources, Travel. You can follow any responses to this entry through the RSS 2.0 feed. You can leave a response, or trackback from your own site.